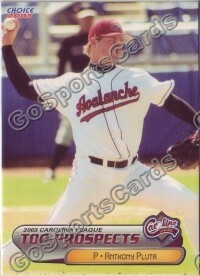 I have one card of Joe Bateman, from 2003 Pepsi Grandstand Salem-Keizer Volcanoes. This was a personally-autographed card received in a trade with Prowling Cat. Playing career: Joe Bateman pitched ten seasons in the Giants, Brewers, Rays and A’s organizations. In 423 games he went 45-31 with 56 saves and a 3.00 ERA. Where he is now: A youth baseball instructor in Pittsfield, MA. My memories: Only know him from his card. Google Autocomplete results: He is third when you type Joe Bate, between Joe Bates Alan Biller, referring to an investment consultant, and Joe Battle, a transportation executive who oversaw the building of most of the roads in El Paso, TX. Another prominent Joe Bateman is a film festival consultant in London. Coming up next: The next profile will be Tim Bausher. I saw Star Wars: The Force Awakens for the third time this weekend. I am a huge Star Wars fan and while I enjoyed the prequels tremendously (unlike some fans) there's no doubt that this one is better in most ways. The old characters are still great and the new ones are a lot of fun and fit in seamlessly. While Rey might be a great Jedi one day, one great Jedi who is active currently is JediJeff of 2 by 3 Heroes. I was fortunate to get cards from two separate sections of his Tis The Season giveaway. One section was a whole bunch of 2015 from three of Topps's alternate brands. It's funny how one of the justifications for giving Topps a monopoly was to reduce confusion, and yet Topps is putting out lots of similar brands like Gypsy Queen, Heritage and Archives. How many throwback sets do we need each year? Still, as a completist, I am glad to have these cards. He also sent a bunch of cards that were duplicates from his throwback-jersey collection. I was not originally a fan of the whole throwback-jersey gimmick, but I kind of like cards like these when the uniforms are ones I remember from when I was younger. It also goes to show how much attention I really pay to uniforms - for this Bronson Arroyo card and a few others my thoughts were along the lines of - "This is a throwback? I didn't even realize they don't wear this uniform anymore". If anyone else has or wants to start a throwbacks mini-collection let me know - I am going to have quite a few dupes to trade. Also will have a few dupes of the other sets above available for trade as well. 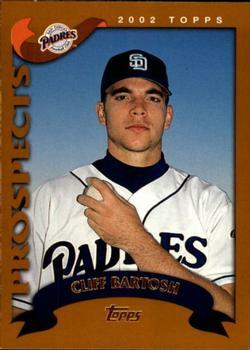 I have one card of Cliff Bartosh, from 2002 Topps Traded. Playing career: Cliff Bartosh pitched for the Indians in 2004 and the Cubs in 2005. In 53 games he went 1-2 with a 5.08 ERA. Where he is now: Owns Full Armor Sports Training and is an Assistant Coach at Duncanville High School in Texas. Google Autocomplete results: He is fourth when you type Cliff Bart, between Cliff Bartow, CEO of Family Christian Stores, and Cliff Barton Obituary, referring to the former CEO of US Bancorp. There do not appear to be any other prominent Cliff Bartoshes. Coming up next: The next profile will be Joe Bateman. I have one card of Ricky Barrett, from 2005 Topps Updates and Highlights. Playing career: Ricky Barrett pitched in the Twins organization from 2002 to 2008. In 199 games he went 30-16 with a 3.35 ERA. Despite solid numbers as a middle reliever for three years in AAA he never got promoted to the majors, and instead went to Japan where he pitched briefly in 2009. My memories: Last month he shared his thoughts on baseball cards with this blog. Where he is now: A mortgage loan officer at First Priority Financial in Sacramento. Google Autocomplete results: He is seventh when you type Ricky Bar, between Ricky Barber, a barber shop in Texas, and Ricky Barnes Golf, a member of the PGA Tour. Another prominent Ricky Barrett is a financial planner in Australia. Coming up next: The next profile will be Cliff Bartosh. 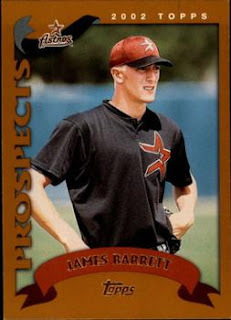 I have one card of James Barrett, from 2002 Topps Traded. Playing career: James Barrett pitched five seasons in the Astros organization. In 99 games he went 32-23 with a 4.30 ERA. Where he is now: Anyone know where James Barrett is now? Google Autocomplete results: He is eight when you type James Bar, between James Barone Racing, an auto parts seller, and James Bartley, a character in a 19th-century story who was swallowed by a whale. There are no references to the ballplayer on the first page of Google results; most refer to a Massachusetts Militia Colonel who fought at the Battles of Lexington and Concord. Coming up next: The next profile will be Ricky Barrett. Josh Newman pitched six seasons of professional baseball. He made the major leagues in 2007 and 2008 with the Rockies and the Royals. 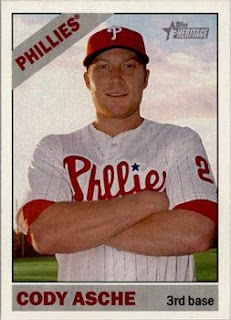 Now the pitching coach at Marshall University, he kindly answered my question about his favorite card. "My favorite is the upper deck rookie card." I have one card of Brandon Barnes, from 2013 Topps. 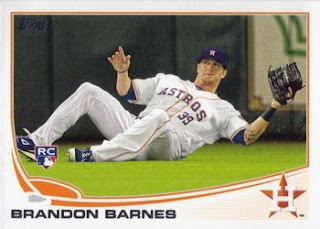 Playing career: Outfielder Brandon Barnes came up with the Astros briefly in 2012 and was a regular in 2013, hitting .240 with 8 HR and 41 RBI in 136 games. After the season he was traded to Colorado for Dexter Fowler. Where he is now: Still putting up mediocre numbers with the Rockies. In 2015 he played in 106 games, hitting .251 with 2 HR and 17 RBI. Google Autocomplete results: He is seventh when you type Brandon Ba, between Brandon Bailey, a journalist, and Brandon Bassham, a comedian. Another prominent Brandon Barnes is drummer for the band Rise Against. Coming up next: The next profile will be James Barrett. I have one card of Darryl Banks, from 1984 TCMA. Playing career: Darryl Banks pitched in the Cubs and Indians organizations from 1980 to 1984. In 101 games he went 31-35 with a 4.81 ERA. Where he is now: Owns Banks Pacific Construction in Hawaii. Google Autocomplete results: He is fifth when you type Darryl Ba, between Darryl Baker, a former high school basketball star, and Darryl Barthe, a sociologist. There are no entries for the ballplayer on the first page of Google results; most refer to a comic book artist. Coming up next: The next profile will be Brandon Barnes. 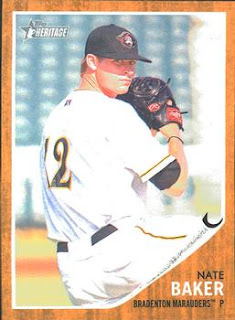 I have one card of Nate Baker, from 2011 Topps Heritage Minors. Playing career: Nate Baker pitched in the Pirates organization from 2009 to 2014. In 151 games he went 29-28 with a 3.89 ERA. Where he is now: He pitched in the independent leagues in 2015, going 1-4 with a 4.58 ERA for Ottawa and Bridgeport. Google Autocomplete results: He is first when you type Nate Bak, ahead of Nate Bakke, a contestant on The Bachelorette. Another prominent Nate Baker is a musician. Coming up next: The next profile will be Darryl Banks. 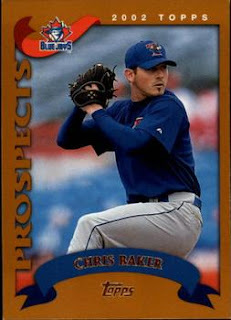 I have one card of Chris Baker, from 2002 Topps Traded. Playing career: Chris Baker pitched nine seasons of professional baseball, mostly in the Blue Jays organization. In 234 games he went 65-59 with a 4.33 ERA. Where he is now: Anyone know where Chris Baker is now? Google Autocomplete results: He is first when you type Chris Bak, ahead of Chris Baker Jets, a former tight end. There are no entries for the baseball player on the first page of Google results; most refer to a defensive end for the Redskins. Coming up next: The next profile will be Nate Baker. 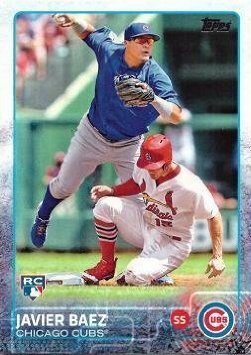 I have one card of Javier Baez, from 2015 Topps. Playing career: Javier Baez came up with the Cubs in 2014. In 80 major league games he has hit .201 with 10 HR and 24 RBI. Where he is now: Still with the Cubs despite many trade rumors this off-season. My memories: One of many high-profile prospects the Cubs are developing. His postseason batting lines really personify the Cubs’ 2015 postseason. In the NLDS he hit .800; in the NLCS he hit .100. Google Autocomplete results: He is fifth when you type Javi, between Javier Munoz, an actor, and Javier Pena, a DEA agent. There do not appear to be any other prominent Javier Baezes. Coming up next: The next profile will be Chris Baker. 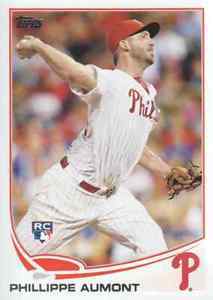 I have one card of Phillippe Aumont, from 2013 Topps. Playing career: Philippe Aumont pitched for the Phillies from 2012 to 2015. In 46 games he went 1-6 with a 6.75 ERA. Where he is now: Signed with the White Sox for 2016. Google Autocomplete results: He is tenth when you type Phillipp, after Filipino, an ethnicity. There do not appear to be any other prominent Phillippe Aumonts. Coming up next: The next profile will be Javier Baez. I have one card of Cody Asche, from 2015 Topps Heritage. Playing career: Cody Asche emerged as the Phillies’ regular third baseman in 2014. In 121 games he hit .252 with 10 HR and 46 RBI. Where he is now: He had another OK season in 2015. In 129 games he hit .245 with 12 HR and 39 RBI. Google Autocomplete results: He is first when you type Cody As, ahead of Cody Associates, a security training company. There do not appear to be any other prominent Cody Asches. Coming up next: The next profile will be Phillippe Aumont. 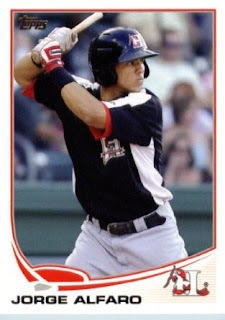 I have one card of Jorge Alfaro, from 2013 Topps Pro Debut. Playing career: Catcher Jorge Alfaro played in the Rangers organization from 2010 to 2015. In 449 games he hit .260 with 52 HR and 249 RBI. Where he is now: He was traded to the Phillies in mid-2015 as part of the Cole Hamels deal, but injuries limited him to just three rehab games. Google Autocomplete results: He is second when you type Jorge Al, between Jorge Alvarez, a singer, and Jorge Alberti, an actor. Another prominent Jorge Alfaro is Commercial Food Manager at NewPort Tank Containers. Coming up next: The next profile will be Cody Asche. I have one card of Kevin Ahrens, from 2008 TriStar. Playing career: Third baseman Kevin Ahrens was the Blue Jays first-round pick in 2007. He spent seven years in their system and two more with the Braves without getting out of AA ball. In 934 games he hit .242 with 62 HR and 407 RBI. Last year he hit .238 with 9 HR and 64 RBI at AA Mississippi. Where he is now: Signed with the independent Lancaster Barnstormers for 2016. Google Autocomplete results: He is fifth when you type Kevin Ah, between Kevin Ahearn NJ, referring to a school superintendent, and Kevin Ahern Biochemistry, a professor at Oregon State. Another prominent Kevin Ahrens is a psychologist in Illinois. Coming up next: The next profile will be Jorge Alfaro. Infielder Kevin Howard played ten seasons of professional baseball, appearing in over 1,000 games and hitting .284 for his career. His best season was 2005, when he hit .296 with 12 HR and 70 RBI for Chattanooga. Now a minor league hitting coach in the Indians organization, he kindly answered my questions about baseball cards. "So that’s my favorite card of myself I posted above. I wish I had some cool card stories for you but I couldn’t think of any. I don’t really collect cards either." Thanks! I don't have that card, but here is one from my collection. I have one card of Jose Abreu, from 2015 Topps Heritage. Playing career: Outfielder Jose Abreu was a high-profile Cuban defector who had a terrific first season with the White Sox, winning the Rookie of the Year award as he hit .317 with 36 HR and 107 RBI, leading the American League with a .581 slugging percentage and a 173 OPS+. Where he is now: He avoided the sophomore jinx in 2015, hitting .290 with 30 HR and 101 RBI. My memories: I remember him being a highly touted acquisition for the White Sox, but I hadn’t realized just how well he had lived up to the hype. I guess that’s what happens for a star on a bad team. Google Autocomplete results: He is second when you type Juan Ab, between Juan Abello, a billionaire, and Juan Abad, a playwright. Another prominent Juan Abreu is an author. Coming up next: The next profile will be Kevin Ahrens. Anthony Pluta pitched six seasons in the Astros, Pirates and Rangers organizations. His best season was 2001, when he went 12-4 with a 3.20 ERA for Lexington. Now the manager of the Victoria Eagles, a Canadian youth baseball team, he kindly answered my questions about baseball cards. "When I was younger I was a huge baseball card collector. I have every Topps baseball set from the year I was born, 1982, to 2002. I used to go with my father to card shows in Las Vegas all of the time. They are some of my fondest memories. There was a lady that lived behind me that was the biggest collector of baseball cards I know. She never missed an opportunity to buy cards of her favorite baseball players at card shows. She recently passed away and I along with family inherited her collection. It took up one whole room in her house. It has been fun going through all of her cards and reminiscing of old times. A quick story about baseball cards. All professional baseball players are asked to sign a Topps contract in spring training and are given a $5 check. (At least that was the case when I was playing.) I didn't really know what it was for but thought it was cool that I was getting $5 from Topps. During my first professional season in 2001 I was playing in Lexington, KY and loved talking to the fans and signing autographs. A few months into the season a fan came down to ask for an autograph. He was holding a binder that contained baseball cards. Every baseball player has experienced fans like this. I was signing autographs on balls and shirts and this fan opened his binder and asked if I would sign some cards for him. As I looked down I saw 3 pages of Topps baseball cards with my picture on them (shared with Justin Wayne). I had never seen them before and asked where he had them made. He told me that he opened a pack of cards and got one so he bought a couple of boxes and kept all that he found to put in his binder. I had no idea that I had a baseball card and thought that he was joking. He gave me one whole sheet and I signed the rest. The next day I went to the store and bought a box of cards so I could see for myself. When I opened the first pack I found one of my cards and it was one of the most exciting days of my career. 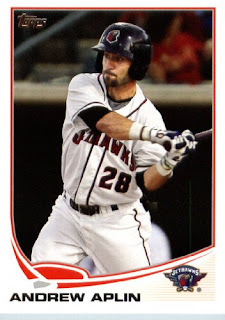 My favorite baseball card is from a team set when I played in the Carolina League. I was in a prospect set and only pitched in 3 games due to needing Tommy John surgery. I thought that it was funny that I was considered a prospect in the league that I wasn't even playing in." Scott Gentile pitched seven seasons of professional baseball, mostly in the Expos organization. His best season was 1994 when he went 5-2 with 26 saves and a 1.93 ERA at West Palm Beach. Now a Senior Sales Professional at Takeda Pharmaceuticals in Florida, he kindly answered my questions about baseball cards. "I used to collect baseball cards when I was a kid. I gave that collection to my nephew years ago. To be honest I do not have a favorite card, my wife has a few of my old cards she keeps in the family." 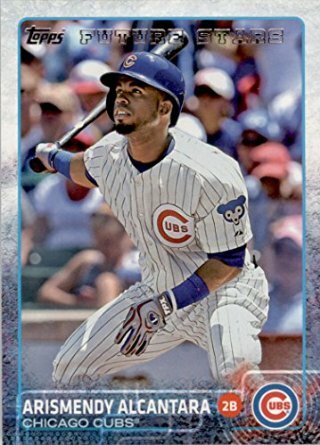 I have one card of Arismendy Alcantara, from 2015 Topps. Playing career: Second baseman Arismendy Alcantara made his big league debut with the Cubs in 2014. In 70 games he hit .205 with 10 HR and 29 RBI. Where he is now: Spent most of 2015 at AAA Iowa, again displaying low batting average but some power (.231, 12 HR, 36 RBI). 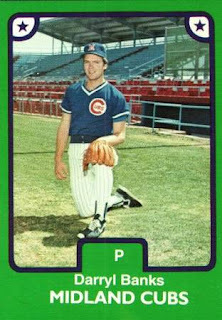 He did play in eleven games with the Cubs but hit just .077. Google Autocomplete results: He is first when you type Arism, ahead of Aritmetica, the Spanish word for arithmetic. There do not appear to be any other prominent Arismendy Alcantaras. Shortstop Bobby Haney played four seasons in the Giants organization. In 266 games he hit .262 with 6 HR and 96 RBI. He is now a youth baseball instructor and author of the book From Kings Park to Omaha, about his experiences growing up on Long Island and playing in the College World Series for South Carolina. He kindly answered my questions about baseball cards. "My favorite card is a Derek Jeter rookie card and no I don't collect baseball cards." Anthony Claggett pitched professionally for seven years, making the major leagues with the Yankees and Pirates in 2009. In 268 minor league games he went 35-26 with a 3.32 ERA. Now an assistant coach at Riverside City College, he kindly answered my questions about baseball cards. "I was a very big card collector when I was younger. I used to organize them by team, position and name. I think my favorite card is a old Willie Mays card that my dad got me from a garage sale. It's not in perfect condition but it's still pretty neat. I have a couple cards of myself but I gave most of the cards away to friends and family who wanted them." I have one card of R.J. Alvarez, from 2013 Topps Pro Debut. Playing career: Originally drafted by the Angels, R.J. Alvarez was sent to the Padres in the Huston Street trade, and made his major league debut in 2014, going 0-0 with a 1.13 ERA in ten relief appearances. Where he is now: Involved in a mid-season deal for the second straight season, Alvarez was part of the package Oakland received from Derek Norris. In 21 games with the A’s, Alvarez went 0-0 with a 9.90 ERA. Google Autocomplete results: He is fourth when you type R.J. A, between R.J. Anderson, an author, and R.J. Archer, a quarterback in the Arena Football League. There do not appear to be any other prominent R.J. Alvarezes. 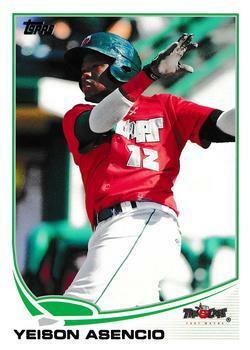 I have one card of Yeison Asencio, from 2013 Topps Pro Debut. 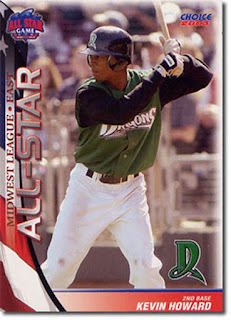 Playing career: Outfielder Yeison Asencio signed with the Padres in 2009 and has slowly worked his way through their system. In 537 games he has hit .301 with 50 HR and 316 RBI. Where he is now; In 2015 he played in 126 games at AA San Antonio, hitting .301 with 13 HR and 74 RBI. Google Autocomplete results: He is fifth when you type Yeis, between Yeast Infection, a medical condition, and Yeisimar Menotas, a musician. There do not appear to be any other prominent Yeison Asencios. I have one card of Andrew Aplin, from 2013 Topps Pro Debut. Playing career: Outfielder Andrew Aplin was drafted by the Astros in 2012. He had a very good, if somewhat unusual, batting line in 2013 at Class-A Lancaster, hitting .278 with 9 HR and 107 RBI. Very unusual to see a 100-RBI season anywhere in the minor leagues, especially with fewer than ten home runs. He has split each of the past two seasons between AA and AAA. Where he is now: In 2015 he split the season between Corpus Christi and Fresno, hitting .296 with 2 HR and 40 RBI. Google Autocomplete results: He is fourth when you type Andrew Ap, between Andrew Applepie, a musician, and Andrew Aprile, a music teacher in Queens. Another prominent Andrew Aplin is a doctor in Pennsylvania. Coming up next: The next profile will be Yeison Asencio. 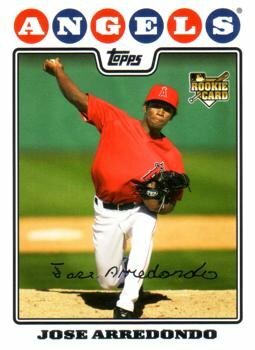 I have one card of Jose Arredondo, from 2008 Topps Update. 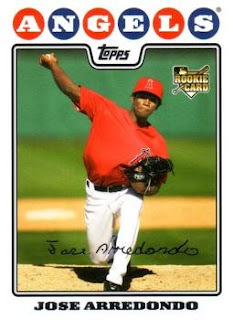 Playing career: Jose Arredondo pitched for the Angels and Reds from 2008 to 2012. In 214 games, all in relief, he went 22-11 with a 3.27 ERA. Where he is now: Anyone know where Jose Arredondo is now? Google Autocomplete results: He is ninth when you type Jose Ar, between Jose Arias, a pitcher in the Marlins organization, and Jose Arguelles, an author. Another prominent Jose Arredondo modified tube amps for the likes of Ozzy Osbourne and Metallica. Coming up next: The next profile will be Ezequiel Astacio. I have three cards of Norichika Aoki. 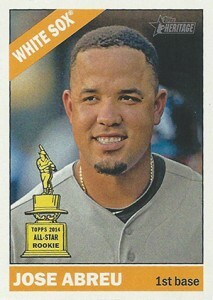 This one is from 2012 Topps. 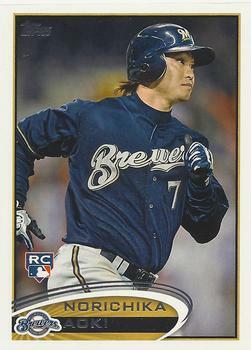 Playing career: Outfielder Norichika Aoki came to the US from Japan at age 30 in 2012. 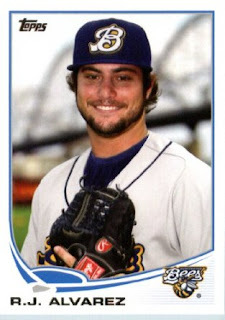 He played two seasons for the Brewers and was then traded to the Royals. Despite hitting just .071 against them in the 2014 World Series, the Giants liked what they saw and signed him as a free agent. Last year he hit .287 with 5 HR and 26 RBI in 93 games for San Francisco. Aoki has been remarkably consistent – in his four MLB seasons his batting averages have been .288, .286, .285 and .287, while his OBP has ranged between .349 and .356. Where he is now: Signed with the Mariners for the 2016 season. My memories: He was highly touted when he came from Japan as a high-BA, high-OBP player. He has been consistent as a regular, though no star. Google Autocomplete results: He is third when you type Noric, between Noric, a Celtic language, and Norice, referring to Norway and Iceland. There do not appear to be any other prominent Norichika Aokis. Coming up next: The next profile will be Jose Arredondo. 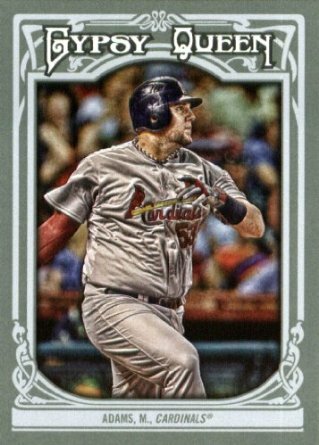 I have one card of Matt Adams, from 2013 Topps Gypsy Queen. Playing career: First baseman Matt Adams came up with the Cardinals in 2012 and became a regular in 2013, hitting 32 HR over the next two years. He helped the Cardinals win the 2014 NLDS with a three-run home run off of Clayton Kershaw to erase a 2-0 deficit in Game 4 to give the Cardinals a 3-2 win. Where he is now: Injuries limited him to just 60 games in 2015. He hit .240 with 5 HR and 24 RBI. My memories: He is one of many new faces the Cardinals seem to trot out every year that get big playoff hits. I think I was listening to the game in the car when Adams hit that homer off of Kershaw. Google Autocomplete results: He is tenth when you type Matt A, behind Matt Altman, a realtor. Another prominent Matt Adams is a Partner at PricewaterhouseCoopers. Coming up next: The next profile will be Norichika Aoki. I have one card of Keto Anderson, from 2002 Topps Traded. 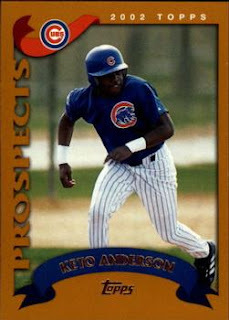 Playing career: Outfielder Keto Anderson played in the Cubs and Padres organizations from 1999 to 2002. In 253 games he hit .321 with 8 HR, 107 RBI and 60 SB. A fuller account of his career can be found at Smed’s Baseball Card Blog. Interesting facts: Brother of former major leaguer Marlon Anderson. Where he is now: Anyone know where Keto Anderson is now? Google Autocomplete results: He is first when you type Keto Ande, ahead of Keto Anders, a psychologist in Finland. There do not appear to be any other prominent Keto Andersons.